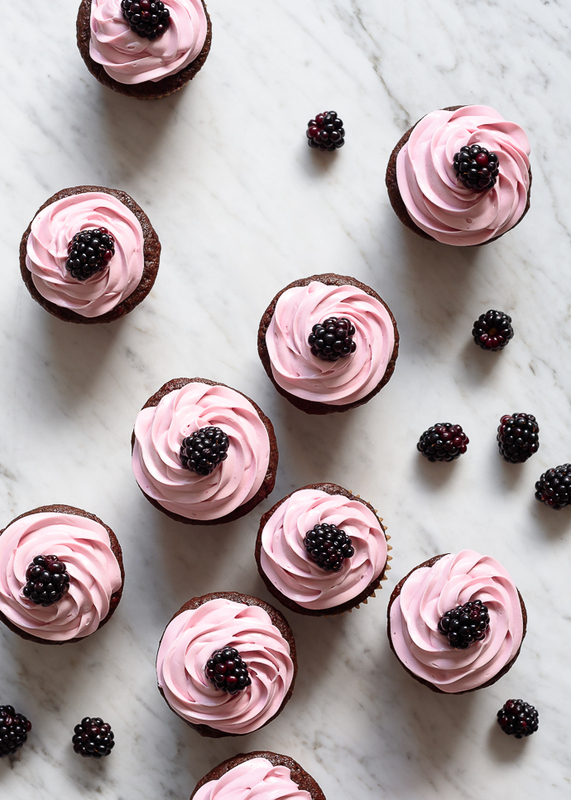 I wrote the original draft of this post, a fluttery collection of thoughts about chocolate and Summer baking and these glorious blackberry chocolate cupcakes, shortly before we flew down to Santa Barbara last week, and a few days before the horrific violence in Orlando during the early hours of Sunday morning. 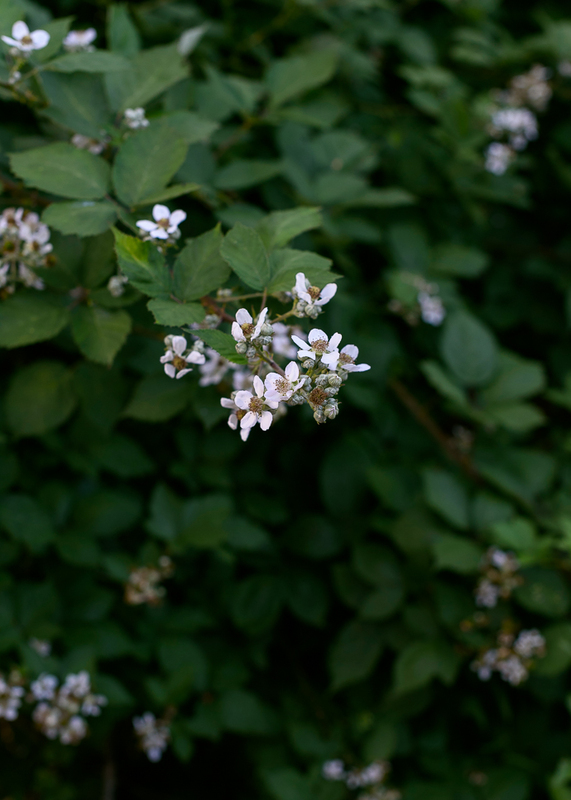 I’d planned to post it on Monday, but the morning of, I couldn’t hit publish. I felt lost, and promptly deleted the whole thing. 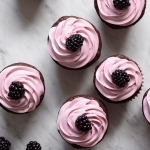 It seemed utterly trivial and insensitive to share a cupcake recipe of all things, complete with fluffy, pink buttercream frosting, and a blackberry on top, after such a painful, maddening event. But it also feels inappropriate not to acknowledge this unspeakable attack on the gay community – and against all of us as Americans. While I still don’t quite have the words, I do firmly believe that everyone deserves to be who they are, and love whomever they love, without fear. 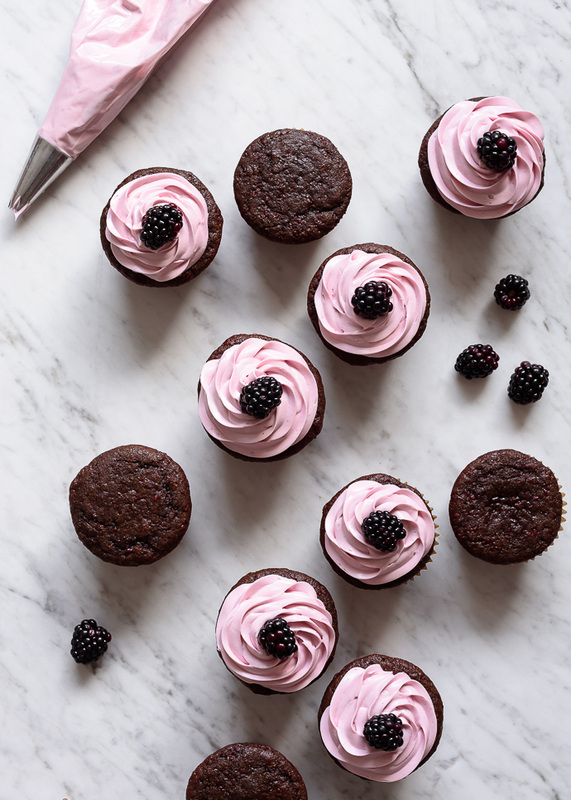 I certainly don’t have all the answers, but being in the kitchen, cooking and baking for loved ones, is the most wonderfully nurturing and comforting thing I know, and these homemade cupcakes – frivolous as they may be in the moment – are my small way of sending some extra love out into the universe today. The heat spell broke long enough at the end of last week that I didn’t mind turning on the oven, and was rewarded for my efforts with the most amazing aroma, that begins with homemade blackberry jam, and transitions into cocoa heaven. 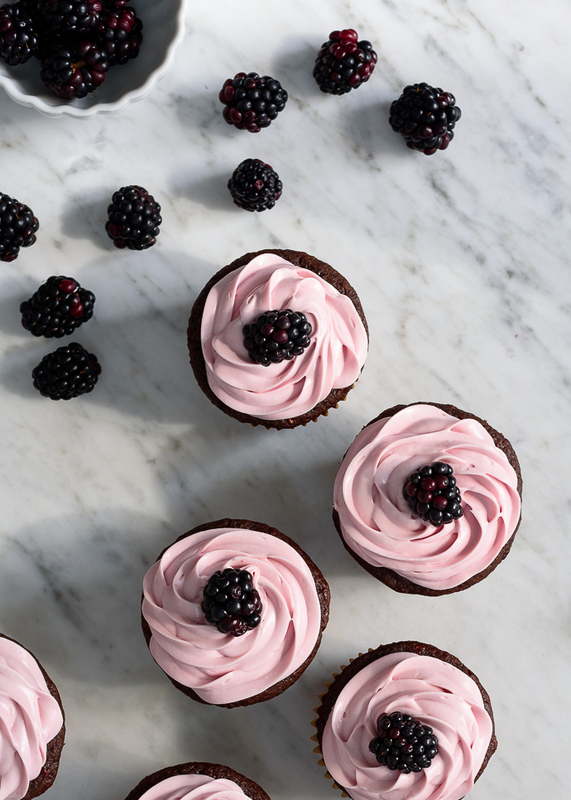 Resulting in, of course, the finished product, these moist and flavorful blackberry chocolate cupcakes. I’d developed these with my Dad in mind, from whom I inherited a deep love of all things chocolate – and who had a birthday this past weekend – but ended up making cheesecake instead. 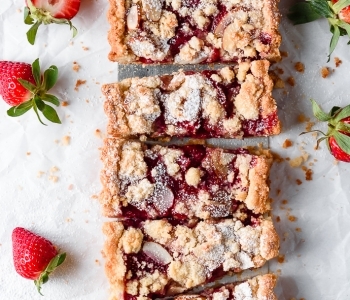 Though they’re a bit dainty in appearance, he would have certainly approved of these as well, as they’re packed with tons of deep cocoa flavor along with a subtle swirl of fresh Summer berries. 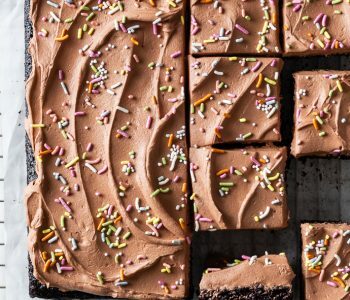 Chocolate lovers, rejoice. 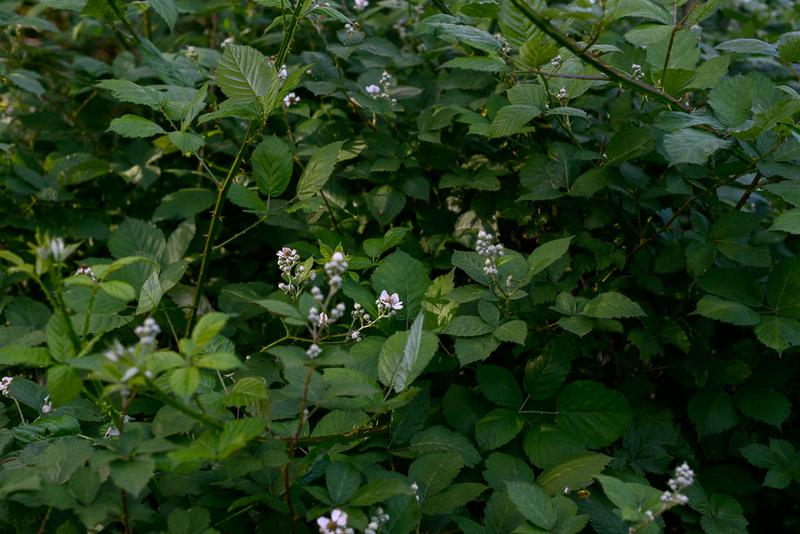 Set aside 12 blackberries for garnish (or 6 cut in half, if they are very large). 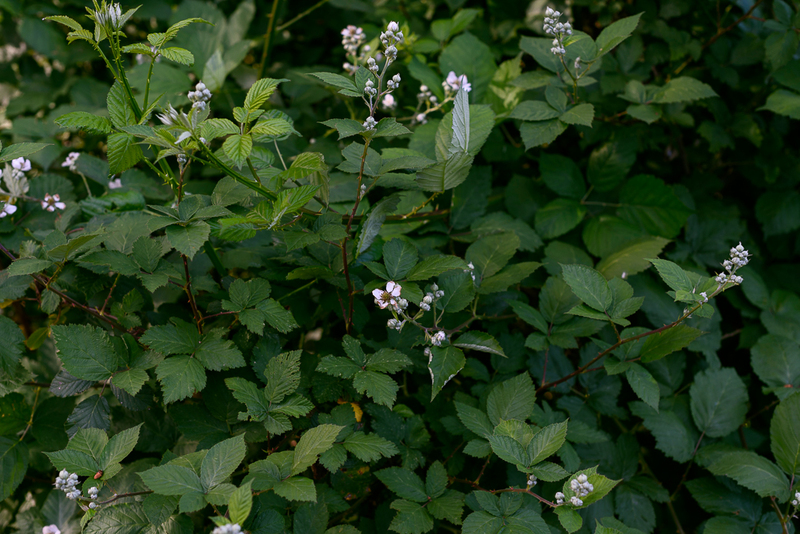 Add the remaining blackberries and 1/4 cup sugar to a medium sauce pot, and bring to a boil. Simmer for 10 minutes, until the berries burst and become jammy. Strain through a fine-mesh sieve, reserving the blackberry liquid. 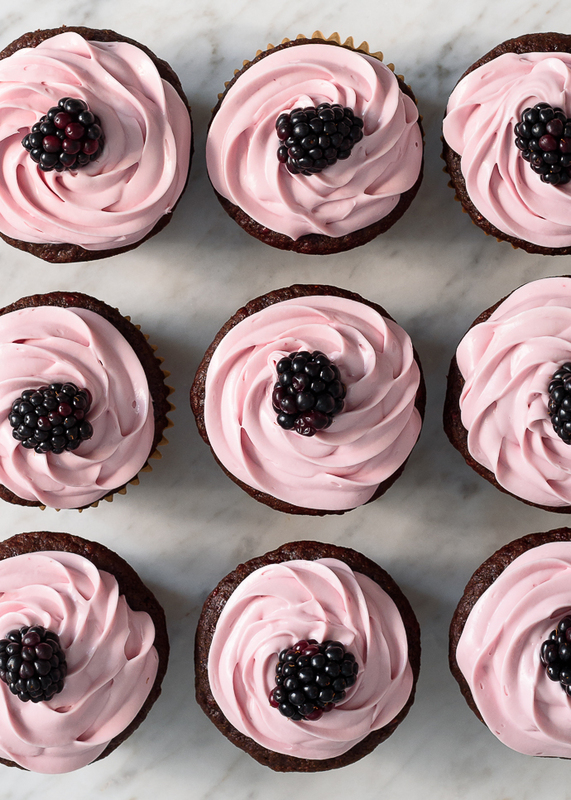 You should end up with about 1/4-1/2 cup of blackberry syrup. Set the blackberry mash aside to cool. Preheat the oven to 350 degrees F. Line a 12-cup muffin tin with paper liners. Set aside. In a large mixing bowl, combine the remaining 1/2 cup sugar, spelt flour, cocoa powder, espresso powder, baking soda, and salt. Stir in the oil, almond milk, and vanilla, and mix until completely combined, but not overmixed. Use a spatula to fold in the blackberry mash, until combined. Using a cookie scoop, divide the batter between the prepared muffin cups, about 3/4 full. 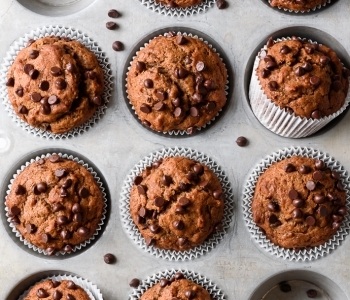 Bake for 18-20 minutes, until a cake-tester inserted into the center of each muffin comes out clean. Remove from the oven and let cool in the pan for 5-10 minutes. Remove from the muffin pan, and let cool completely before frosting. Using a stand up mixer fitted with the paddle attachment, or a hand mixer, beat the butter until light and fluffy. Add the sifted powdered sugar, a half cup or so at a time, until the frosting is thick and creamy. 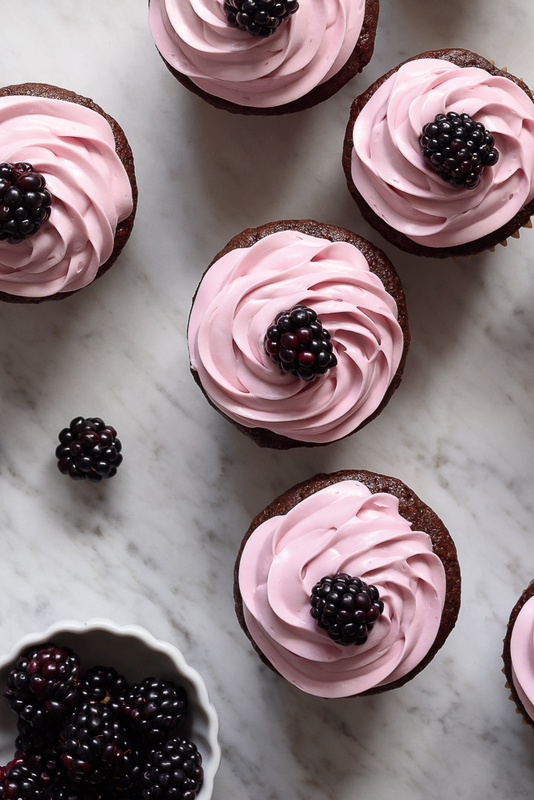 Drizzle in the reserved blackberry syrup until the buttercream frosting reaches your desired consistency, preferably thick enough to hold its shape on the cupcakes. 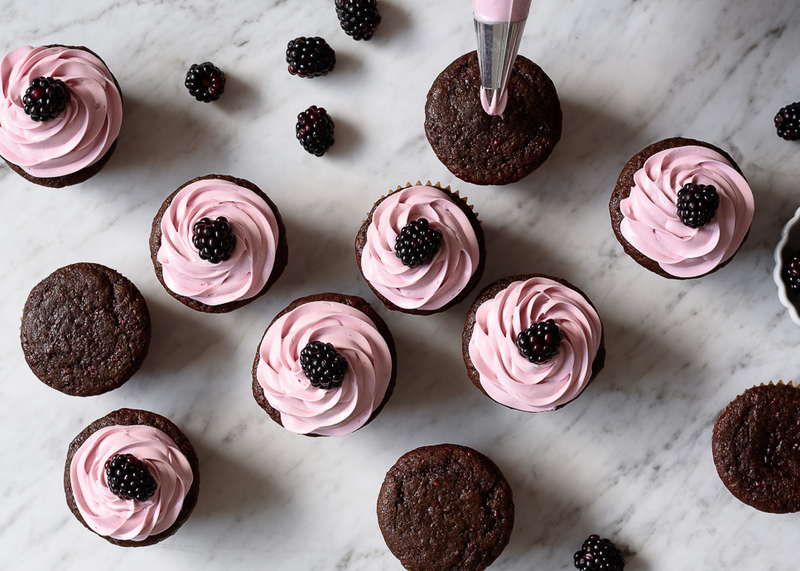 Use a piping bag with fluted tip – or a butter knife – to frost the cupcakes. 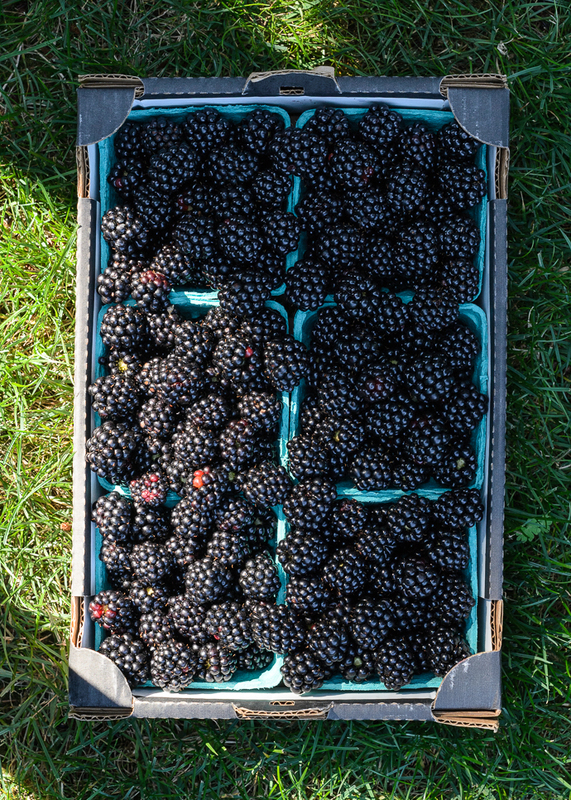 Top each with a blackberry. Serve immediately. Store any leftovers in a covered container at room-temperature or refrigerated if longer than a day. I’m excited to give these a go, they’re beautiufl & sound delicious! Do you have nut-free substitute suggestion for the almond milk? Hi! If you’re not vegan, you can use regular dairy milk or unsweetened soy milk. Oat milk might work too, though I find it has a stronger, sweeter flavor. Enjoy!! 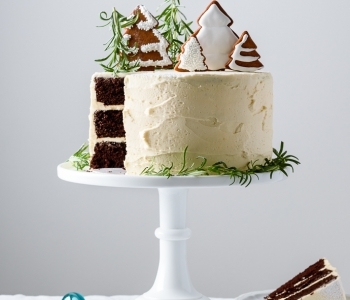 I would like to use this recipe for a cake…I am not a big baker so could you give me any information on how to or if needed to change this to a cake recipe? I already made the cupcakes as a trial and they were delicious! I am making the cakes for my sons first birthday. Thanks! Made these today, have them in the freezer as it seems the bbuttercream is bavng trouble holding its shape, it was stiff when piped but then as I was piping the others it was melting out of its shape… any suggestions for next time? I did find that I had to add a bit more powder sugar to thicken it originally (maybe 3.5 c vs the original recipe) . No worries the freezer does wonders for holding buttercreams shape 🙂 until devoured . Didn’t realize you were in Washington. I do freelance vegan (and not) cupcakes and cookies in the Seattle area. Happy to have found you! Stunning Laura! And these are vegan!!! WOW! So beautiful. I do not blame you about not posting on Monday. Our worlds turned upside down. It is such a sad event. I do not know what else to say. 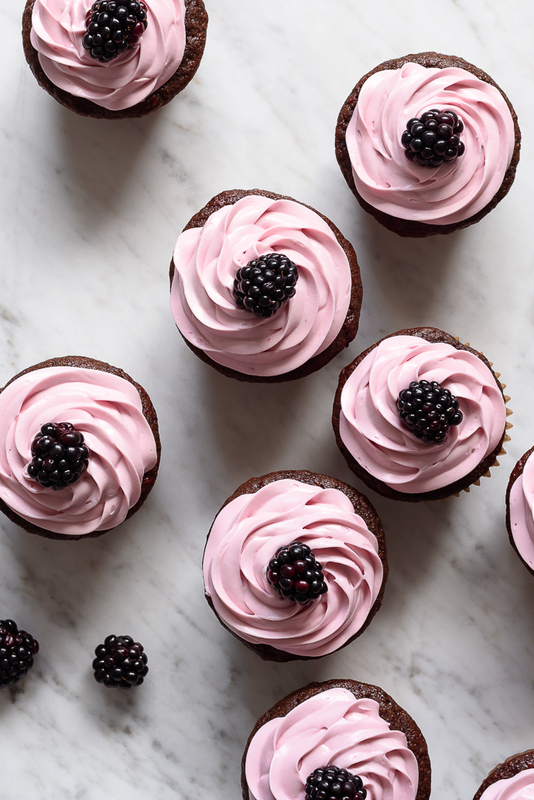 It took me a minute to realize that the fluffy pink coloring of the frosting was because of the blackberry syrup. Beautiful! 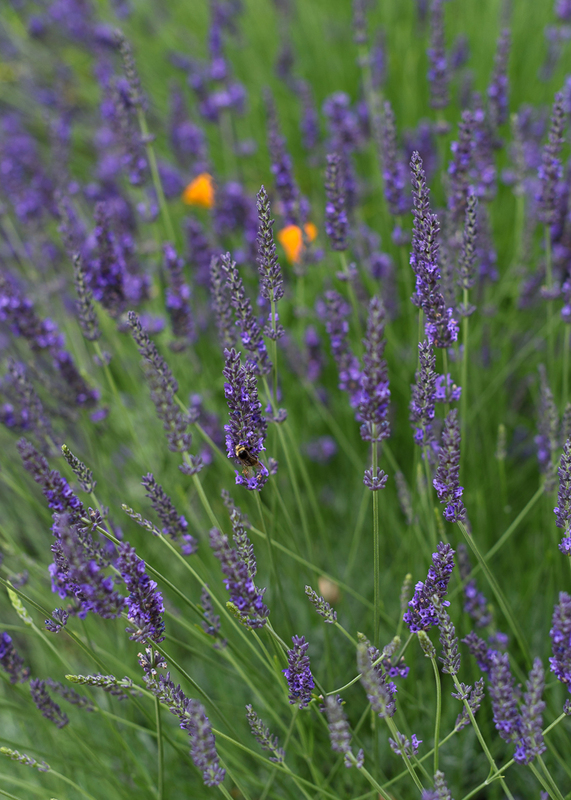 These are absolutely gorgeous Laura!! Stunning. Thank you so much, Ellie! !